Good Thursday morning, gang... and, indeed, the docket's foreseen "tale of two 'cities'" has come to pass. All of a day after a priest whose vocation he helped inspire was given the high-hat, this morning B16 named Bishop Paul Coakley, 55 -- head of Northern Kansas' diocese of Salina since 2005 -- as archbishop of Oklahoma City, accepting Archbishop Eusebius Beltran's resignation from the post 16 months after the incumbent reached the retirement age of 75. 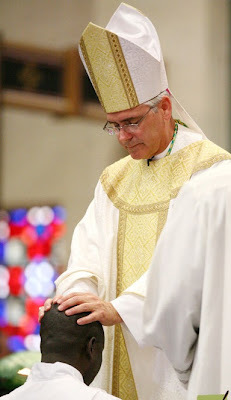 After a year of numerous surprise moves among the docket's topmost files, it could be said that Coakley's ascent is among the least unexpected of the bunch; his name atop the OKC buzzmill for the better part of the last year, the Wichita-bred prelate -- a career pastor and spiritual director, both in his home diocese and over several years in seminary work at Mount St Mary's in Emmitsburg -- comes equipped with a vitality of voice and work-ethic to tackle a 105,000-member local church with relatively few and uneventful challenges as the wider scene goes... but one whose distinct need for priestly vocations plays especially to his strong-suit. With less than six years under his belt as head of Northwest Kansas' church of 50,000, the archbishop-elect has garnered particularly notable success as a recruiter of future clerics -- the Salina church entered this academic year with 16 seminarians, the largest formation class it's seen in over two decades. At the same time, given the vacancy that now arises from it, this morning's move short-circuits a pastoral planning initiative slated to trigger there in the New Year which the archbishop-elect launched with an All Saints' Day pastoral on the call to holiness. At 55, Coakley becomes the second-youngest of the nation's 32 Latin-rite archbishops, 18 of whom have now been named by the reigning pontiff. Yet among the metropolitans, at just shy of six years since his ordination in Salina, the Oklahoma pick has the shortest amount of episcopal experience. With his appointment, Coakley joins six other Stateside archbishops named to the rank with less than a decade on the bench -- a fairly select group that likewise includes Archbishops Tim Dolan of New York, the coadjutor of Los Angeles José Gomez, Jerome Listecki of Milwaukee, Cincinnati's Dennis Schnurr, Seattle's Peter Sartain and San Antonio's Gustavo Garcia-Siller MSpS -- all of whom, except Dolan, have been moved up within the last year. The Oklahoma prelate will join Gomez, Sartain and Garcia-Siller in receiving the pallium from the Pope in Rome on the feast of Saints Peter and Paul, next 29 June. As a result of the move, the number of US Latin-church vacancies now rises to four, while the group of dioceses led by a bishop serving past the retirement age of 75 falls to nine. 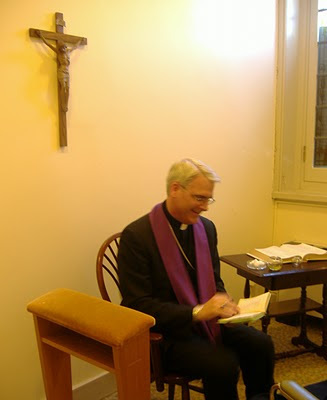 Coakley will be installed on 11 February, the feast of Our Lady of Lourdes.